This weekend is the equinox. All places on the planet will have 12 hours of daylight and 12 hours of darkness. Evenings are now too dark for safe riding. My Mistress is in a box and on her way home. 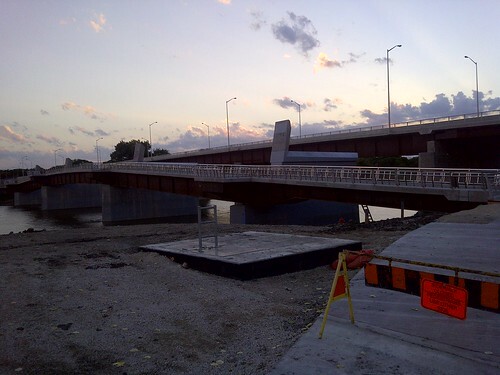 Last night was my last ride in Winnipeg (“Muddy Water”). 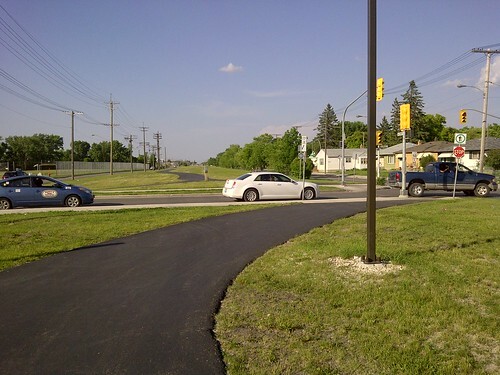 Winnipeg’s cycling network is quite new – it was put in place less than 5 years ago. I found it interesting to see how the city put a cycling network in place relatively quickly and at seemingly low cost. If I had one word to describe Winnipeg’s strategy, it is “flexibility”. 1. Side streets. A lot of routes use side streets that run parallel to the main roads, letting cyclists follow roughly the same traffic patterns as automobiles but staying away from them. 3. Traffic circles. 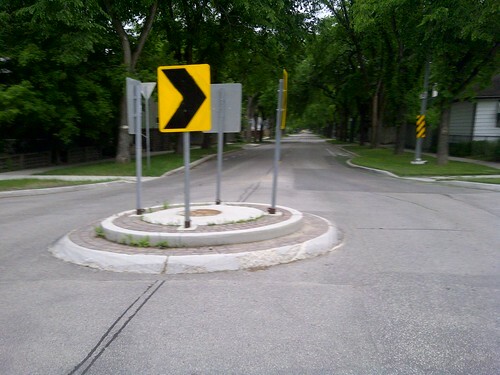 These are so small, it’s almost an embarrassment to call them traffic circles. However they are effective. On the intersections of quieter roads, both cars and bikes are forced to slow down before entering the intersection. 4. Recreational paths. 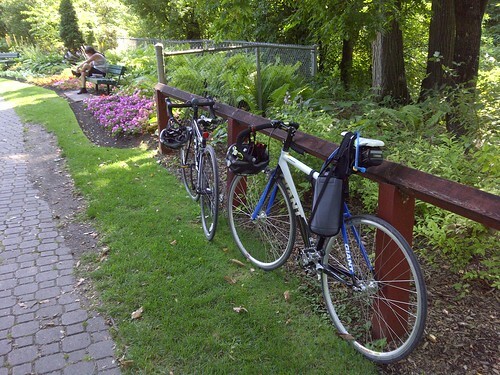 There are a lot of paths are intended for multi-use. 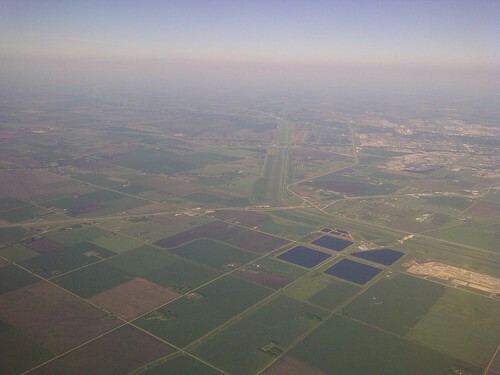 These generally follow green spaces within the city, cover many kilometers, and are well surfaced. They are a great way to stay out of traffic. 5. “S” intersections. Where recreational paths do cross roads, they curl in an “S” to force cyclists to slow down before entering the intersection. This seemingly minor design prevents you from being overcome by your own inertia. 6. Unsurfaced paths. There are a lot of paths, especially next to the rivers, that are hard packed dirt covered with very fine gravel or sand. They usually skirt their way around high traffic intersections where the rivers channel traffic into busy intersections. These are almost as good as asphalt for riding. In fact, compared to many Winnipeg roads they are better. 7. Bike lanes. Self explanatory. There aren’t many of them except where there are no route alternatives to high traffic arteries. 8. Sidewalks. Sometimes the routes just don’t stitch together and there isn’t space to put in a lane. The city simply makes the sidewalk a shared facility and nobody seems to mind if you ride on it. 9. “Sharrows”. A terrible term for the worst facility. A cycling icon with a chevron is painted on the road (“share arrow”) to indicate cyclists go here too. 10. Bridges. Being a city of loopy rivers and straight railroads, there are a lot of bridges. 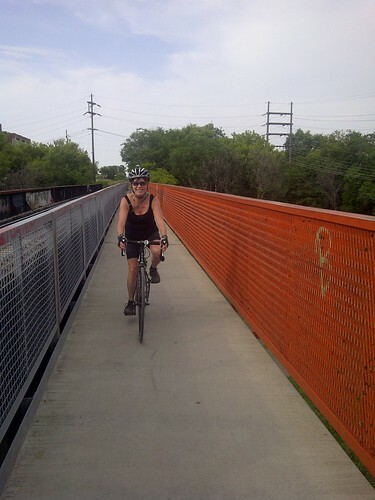 Originally built with pedestrians in mind, the cyclist happily shares the narrow walkway to avoid traffic. If there is a need to cross to the other side of the road there is almost always a path that loops under the footings. 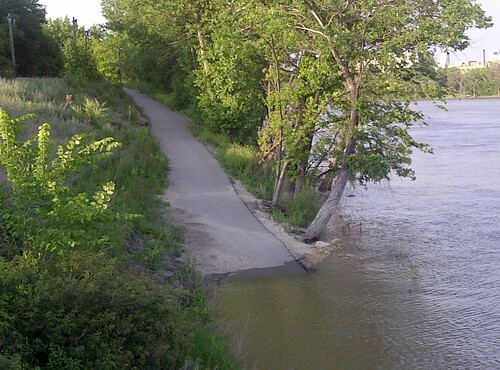 Winnipeg did have one major advantage when setting up its cycling network: space. 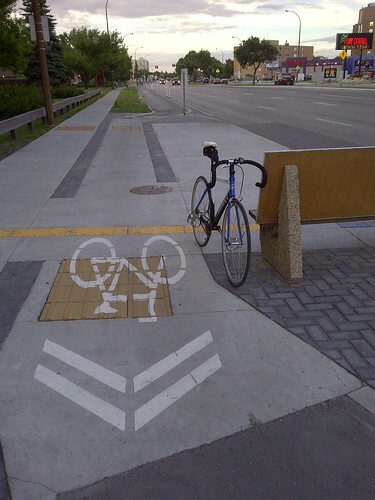 Being a prairie town, spaces are wide so there are often a few feet available for the humble cyclist. I have had only one close call. I was almost the victim of a hit and run at dusk one week ago. A full grown deer bounded across my path (she didn’t have her headlights on) on a quiet residential street. In light of my total riding time I consider that a pretty good safety record that speaks well of the facilities. Posted by Kern on September 20th, 2013. I have ridden every available night since May, and still discovered a new path on my last night riding. That's pretty good going! Cycling facilities in Winnipeg certainly look much better than those we're used to in the UK where we've got a chronic shortage of space. Glad you managed to avoid the deer, I certainly wouldn't be expecting one of those on a residential street! 'Big space' that really is big space. I don't know whether I'd like it or not. For a while, probably. You did well to keep the cycling up Kern. I suppose the question is whether Winnipeg's new cycling network has produced an increase in cycling and whether the flatness (condusive) is offset by longer distances between places. I enjoyed the photos (as usual). Interesting stuff. 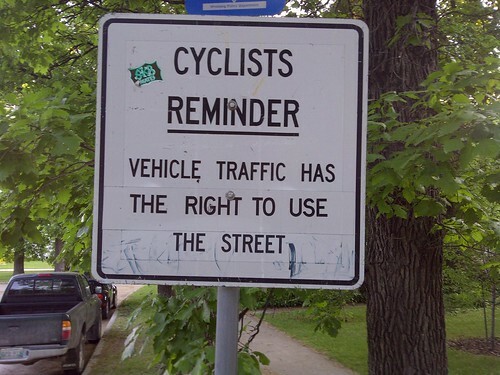 I think there is the will over in the UK for our policy makers to 'do something' about cycling. But in the cities where they are pressed to do whatever that something is they simply do not have the space. Efforts seem to go in to getting cyclists 'out of the way' (which often means on to the path with a white line drawn down the middle) so motorised traffic is unencumbered by such slow road users. Having said that where I live there has been a growth in the sales of single speed bikes like yours and heavy town bikes. It is flat in the immediate area and there is special provision for cyclists, albeit in a piecemeal fashion. Look at the bikes shown as sold on this cycle shop's Facebook page.